Hammering and stitching away in a tiny workshop in Spotswood, Betty Ennis, sole designer and creator of bettybossyboots, is keeping the skill of shoemaking alive. Betty’s innovative designs using skilled technical drawing, cement construction and sustainable materials, have evolved over the past decade into incredible creations striking the perfect balance of fashion, art, form and function. Influenced by a lifetime in fashion, film, the music industry, craft, renovating and building, the bettybossyboots signature series of unisex derby boots and shoes attracts a dedicated indie following. Betty’s shoes were showcased at the curated market for FOMA at MONA in Tasmania and exhibited by Creative Victoria during Melbourne Fashion Week. Sourcing unusual quality leathers, she also creates unique funky men’s and women’s shoes and boots on commission. 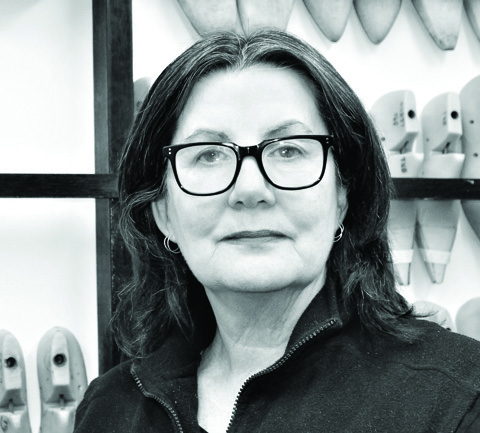 Betty learned the basics of shoemaking at RMIT and completed advanced workshops with Tasmanian shoemaker Luna Newby. Following her passion for the handmade, Betty works using only a vintage sewing machine, traditional hand tools and wet moulds, natural vegetable tan leather toe puffs, stiffeners and hand stack heels. Betty’s boots, which encapsulate art and industry, will be on display and for sale, as part of the Art & Industry Festival 2018 at Two Birds Brewing during their Open Day (date) and as part of Industrial Fashion (date and info).